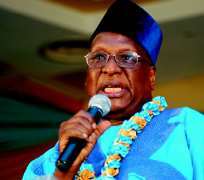 National chairman of the ruling Peoples Democratic Party (PDP), Alhaji Bamanga Tukur, has admonished younger politicians in the country to accord respect to older counterparts and not write them off. Tukur in a message to mark his 78th birthday, underscored the need for older and younger politicians to work together adding that it would facilitate cross-fertilization of ideas and frank exchange of view on how to move the country forward. He urged support for President Goodluck Jonathan’s development strides and further appealed for peace and calm in the country in order to achieve the desired progress. His message read thus “There is a time under the sun for everything. There is a time for sober reflection, a time to bless, a time to make peace, a time to offer wise counsel, time to mend ways and fences and a time to reflect on what the future holds in stock for our beloved Nation, Nigeria. There is indeed a time and season for everything. “I want to thank God immensely for His gift of life to me these past years as l clocked 78 years few days ago. Certainly it is not by power or might or by self-effort. It is by the sheer grace of God for which I remain eternally grateful, humbled and challenged to make Nigeria a better place than I met it. “My birthday gift to my beloved country Nigeria is a prayer that Nigeria will be great, strong, prosperous and a veritable giant in the comity of Nations the world over. “I implore all Nigerians to give their maximum support to the President and Commander-in-Chief of the Nigerian Armed Forces, Dr. Goodluck Ebele Jonathan, as he drives the Transformation Agenda of the Federal Government with the clear vision, mission and objective of wholistically transforming the entire Nigerian social, economic, political and infrastructural landscape in order to make life more abundant and more meaningful for the Nigerian people. “I give our dear President and his team a pat on the back for the wonderful work they are doing towards the provision of democratic dividends to all Nigerians and the actualization of the manifesto of the Peoples Democratic Party. “Similarly, I salute all the Governors from the states controlled by the PDP and indeed all elected or appointed office-holders of PDP extraction for the great job they are doing in their various offices. I encourage them not to flag or fail but to continue to serve the good people of Nigeria with the strength of a lion, the dedication of a monk and the wisdom of Solomon. “I urge politicians across the country to view politics as an avenue and opportunity to offer selfless and meaningful services to our people. All politicians must behave responsibly and be discreet in their words and actions so as not to overheat the polity. Politics is a noble process and it is nobler when politicians play the game in line with the rules, the various Party Constitutions and of course, the supreme law, which is the Constitution of the Federal Republic of Nigeria. “Discipline is a sine qua non to Party politics. Any organization which lacks the capacity or the moral authority to instill discipline in its members is doomed. The need for politicians to be disciplined cannot be overemphasized. We cannot expect Nigerians to entrust their destiny into the hands of politicians if the politicians do not believe themselves. Like Caesar's wife, a politician must be above board in all ramifications. “I have benefited tremendously from the Nigerian society. At my age, I feel obliged at this point to give back to the society the benefit of my experience. Experience, they say, is the best teacher and experience is a commodity of inherently high value. Experience counts. I want to appeal to younger politicians to show deserved respect to their senior compatriots. We, the older politicians, should not be written off yet or regarded as spent political forces. We are still relevant to the Nation and the younger politicians will benefit greatly from our experience, wise counsel, guidance and discipline. “Our dear Country will progress more rapidly with the right blend of old and young politicians. This will facilitate cross-fertilization of ideas and frank exchange of view on how to move the country forward. No young generation which treats her old and experienced statesmen without respect and decorum ever succeeds. “I preach peace to all politicians and Nigerians alike. Peace is invaluable. It is the minimum condition for development. It is the foundation for friendly and mutual concourse. It is perhaps the most important element requisite for meaningful and sustainable progress of any nation. Nigerians should eschew violence, terrorism, brigandage and lawlessness. Politicians should embrace peace so that we will all enjoy the dividends of our democracy in full. “I also call for unity in Nigeria. We can achieve nothing in an atmosphere of disunity. United we stand, but divided we fall.